Just over a week ago I received a very unexpected email. It was from Getty Images via Flickr and it simply said that they had identified twenty of my images which they would like to licence for sale through their Getty Images site. My initial reaction was one of surprise, then I felt flattered after which I started to think about the implications. I had obviously heard of Getty Images, it’s world famous, but the number of images for sale must run into millions, so the chances of one of my images being selected by a buyer or publisher must be very slim. Then the questions started. Did I want to enter into a legal agreement with Getty? What would be the benefit? How much might I earn from a single sale? Would it be worth all the bother for little or more likely, no return? Were there better photo stock libraries I should consider using before making a commitment? Would I need a model release for any of the images which included people? I talked to a few people I knew and read the pros and cons on one or two forums on the internet. 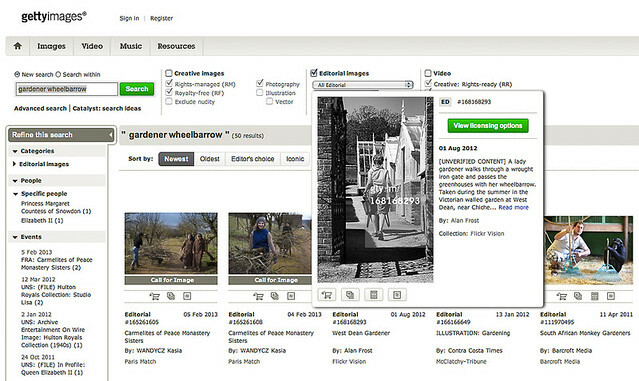 In the end I decided that I had nothing to lose and that I would register as a Getty Contributor and in effect ‘go for it!’ After all, photography is not my profession, I am simply a very enthusiastic amateur and if I receive any royalties, at least it would help fund what is turning into a rather expensive hobby. Given how much commission they pay the photographer, it will definitely not make rich. I also established that if I wanted to publish a book of my own work in the future, that providing the numbers sold didn’t exceed 500, then I could include images which were licensed to Getty. Chance would be a fine thing I thought! I could also enter a ‘Getty image’ into a competition, – LPOTY for example – without it contravening the agreement. So today I started the process of uploading the first few images of the twenty they had selected. This proved to be a quite straight forward process and now the first of my images is for sale on their site……and just to prove it, here is a screen grab of a Gardener at West Dean Gardens which I shot lost year. I shall continue uploading some more images, and keep my eyes open for the first sale…….I will not be holding my breath though, nor giving up the day job! I have of course been wondering how they came to notice my Photostream on Flickr. Well it has to be the ‘Lone Sheep’ image on the Flickr Blog which appeared a week of so ago and I wrote about in my last blog entry. Flickr stats on the rise…..